The Honorable Chris Van Hollen (right) and FNLM Vice President Joseph Perpich, MD, JD. 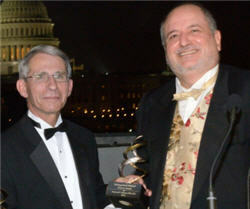 Four people who’ve made outstanding contributions to medicine, public health and health communications were honored by the Friends of the National Library of Medicine at its 2013 awards gala. US Congressman Chris Van Hollen, journalist and physician Sanjay Gupta, MD, scientist Raymond F. Schinazi PhD, ScD, and librarian Richard Wallace, MSLS, EdD were recognized at the event, held September 10 in a rooftop garden overlooking the US Capitol. 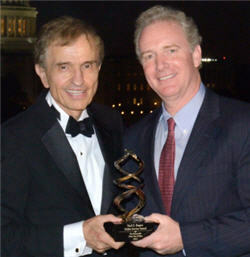 Rep. Van Hollen (D-Maryland) was given the Paul G. Rogers Public Service Award for his support of education, energy, the environment, health care, medical research and civil rights. In accepting the award, Rep. Van Hollen, whose district includes the National Institutes of Health, noted the importance of medical research and the role the library plays in expanding knowledge and discovery. Richard Wallace, a librarian and a professor at the Quillen College of Medicine at East Tennessee State University, received the Michael E. DeBakey Library Services Outreach Award. The award recognizes a librarian who helps rural or underserved populations. Wallace serves the eastern half of Tennessee, which includes 34 hospitals, 25 clinics and 22 counties in the public health department. He has shaped health information programs for Hispanic farm workers, teenagers, cancer patients and nursing home patients. Sanjay Gupta, MD was honored with the Distinguished Health Communications Award. Dr. Gupta is a practicing neurosurgeon and the chief medical correspondent for CNN. 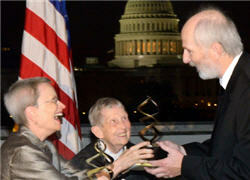 He accepted his award via a video that he recorded while he was on assignment on the border of Syria and Lebanon. Dr. Gupta said he often turns to NLM in his role as a journalist and a doctor. 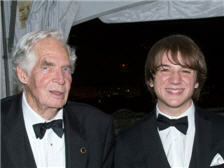 Special guests at the dinner included 16-year-old Jack Andraka of Maryland, a young scientist and 2012 grand prize winner of the Intel International Science and Engineering Fair. Andraka developed a test for early detection of pancreatic, lung and ovarian cancer, and utilized NLM resources such as PubMed Central and BLAST on the way to discovery. Information compiled by Shana Potash, NLM in Focus editor. Photos by Michael Spencer.